Stephen Roche and Greg LeMond got a big gap on race leader Bernard Hinault during the seventeenth stage of the Tour de France in 1985. However, the Irish and American riders let a gold chance slip away. The following is adapted from The Comeback: LeMond LeMond, the True King of American Cycling, and a Legendary Tour de France, published in June by Grove Atlantic. Greg LeMond entered the 1985 Tour de France as an overpaid, overqualified lieutenant to Bernard Hinault, the Badger; hired with explicit orders to help the great Frenchman win a historic fifth Tour victory. LeMond had finished third in his very first Tour, a year earlier. By 1985, many thought the upstart American more than capable of winning the Tour. But he had been hired to ride for Hinault, an arrangement that left LeMond’s American fans perplexed and outraged. However, the arrangement seemed perfectly natural to cycling buffs in Europe. That was how professional cycling worked. In hindsight, the 1985 Tour might well stand as the high water mark of the so-called Anglo-Saxon invasion; an era of unprecedented feats by cyclists from English-speaking nations in a sport that had been utterly dominated by France, Belgium and Italy. Irish sprinter Sean Kelly had won two stages in the 1980 Tour de France and had finished the 1983 and 1984 editions inside the top ten. Australian Phil Anderson had been the first non-European to wear the yellow jersey of Tour leader in 1981 and had logged four consecutive top-ten finishes between 1981 and 1984. Irishman Stephen Roche had ridden well in the 1983 and 1984 Tours and looked capable of outdueling both Kelly and Anderson one day. And when the 1985 Tour was over, English-speaking cyclists would occupy four of the top five places. For Hinault and his La Vie Claire team, the first two weeks of the 1985 Tour unfolded very much according to plan. Roche and LeMond up the road. And a black-eyed Hinault struggling behind on stage 17 of the 1985 Tour de France. Hinault seized the yellow jersey on Stage 8, a 75km time trial. He completed the course more than two minutes faster than LeMond, Roche, Kelly or Anderson. Hinault gained another two minutes on Stage 11 in the Alps and more precious seconds on stage 13 in a time trial. Hinault now led his closest rival, teammate LeMond, by more than five minutes. The race approached the Pyrenees, and Vie Claire coach Paul Köchli finally let LeMond off the leash. Hinault’s lead looked insurmountable, and other men lay within a minute or two of LeMond’s second place. Köchli didn’t want the American to slip to third. Colombian climber Luis Herrera attacked on stage 14, on the day’s major climb. Behind him, LeMond launched a counterattack, joined by other cyclists who posed no threat to Hinault’s lead. The play worked brilliantly, bringing LeMond to the finish minutes ahead of the men in third and fourth place, firming La Vie Claire’s hold on the two top places on the podium. 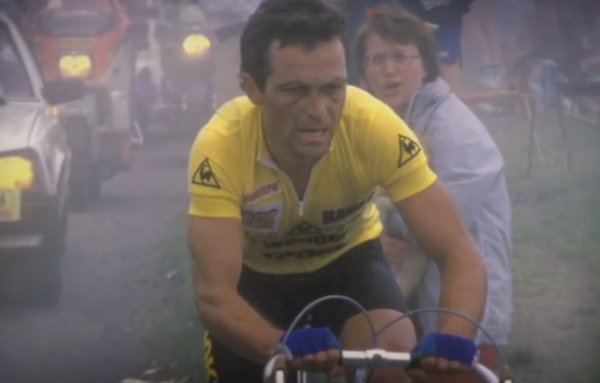 Behind him, Hinault played the role normally assigned to LeMond, blocking the other favorites from breaking free to catch the American. Four hundred metres from the finish, he became ensnared in a suicidal mass sprint. The jostling brought one rider down, and then another, six men in all, hurtling to the pavement at fifty kilometers per hour. One of them was Hinault. The maillot jaune sat on a kerb, stunned and bleeding for several minutes. Race rules dictated that he would not be penalized for a crash so close to the finish. Finally, Hinault staggered to his feet, remounted his bicycle and pedaled limply to the line, blood dripping from his bowed head. Hinault would blame the crash on Phil Anderson of the rival Panasonic team, LeMond’s closest friend in the peloton, whose body and bicycle had brought the Badger down. Hinault suspected Anderson had taken a spill to improve LeMond’s chances. Anderson blamed Steve Bauer, LeMond’s Canadian training partner (and another soldier in the Anglo-Saxon invasion), saying Bauer’s back wheel had slipped on a plastic reflector in the road. The impact had driven Hinault’s Ray-Bans into his nose, breaking it. A pedal had clipped his head. Yet, after a visit to the hospital and a few stitches, the Badger looked no worse for wear. Television cameras pictured him cavorting with his young children later that day, images meant to relieve the French public and to intimidate his rivals. “Any other racer would have abandoned,” recalled Maurice Le Guilloux, the assistant team director. The injuries gradually took their toll. The broken nose forced Hinault to breathe through his mouth; this, in turn, brought on bronchitis. Hinault limped into the Tour’s seventeenth and most difficult stage: two hundred kilometers over a pair of climbs so steep they were rated hors catégorie, beyond categorization. On the slope of the Tourmalet, the highest Pyrenean pass, Hinault began to falter. He was dropped by a group containing Roche, who stood in third place overall. LeMond was riding with Roche and, according to team etiquette, was permitted, even compelled, to follow him, provided he didn’t help Roche. Follow he did, and suddenly the time gap that separated LeMond from Hinault in the race standings began to dwindle. This was before the era when cyclists wore earpieces for constant contact with their teams. From the moment he slipped ahead of Hinault, LeMond never knew precisely where his teammate sat on the road behind him. He knew nothing at all, in fact, until he and Roche approached the final ascent, up Luz Ardiden, and a passing television crew told LeMond that Hinault sat several minutes behind. For the first time in his life, LeMond stood poised to claim the lead in the Tour de France. He had started the day roughly three and a half minutes behind his team leader. Now he sat ahead of him. If he were allowed to attack, he might easily take the race lead. Of course, that triumph would come at Hinault’s expense. LeMond was expected to follow Roche to the finish, an unfortunate but necessary hedge, lest the Irishman ride away with the race. But he was not permitted to help Roche, to take turns setting the pace and blunting the wind as they crawled up the mountainside. If LeMond and Roche worked together, both men would reach the summit that much more quickly; but then Roche might end the day in second place, ahead of Hinault. Shortly after LeMond’s exchange with the television crew about Hinault’s whereabouts, and the subsequent invitation from Roche, a Vie Claire team car rolled up behind them. Le Guilloux relayed LeMond’s queries by walkie-talkie to Köchli, who sat in another team car behind Hinault. Köchli envisioned La Vie Claire claiming first and second places at the Tour; he would not risk aiding the interloper Roche. Video footage did not betray the content of the conversation that followed, only that the perpetually sunny LeMond had finally lost his temper. He waved his arm angrily; he shouted at his coach; he wore a visage of righteous outrage. LeMond pressed Le Guilloux: Exactly how far back was Hinault? About forty-five seconds, Le Guilloux replied. LeMond and Roche rode together; but in a tactical sense, they rode apart. 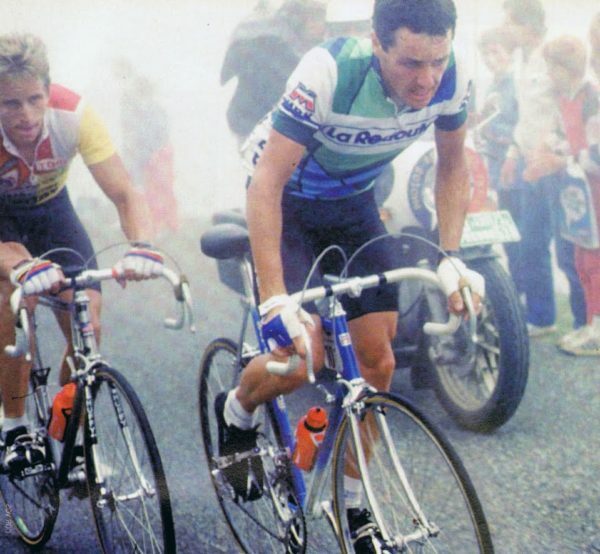 Stephen Roche was setting the pace, slogging up the mountainside and into the wind, while LeMond rode beside him, matching his pace but never lifting it, never aiding him. Roche was conserving his strength, lest LeMond should launch his own attack. The two men had ridden themselves into a stalemate. As LeMond awaited a resolution to his argument with his coaches, other riders loomed ever closer behind. LeMond wanted permission to go all out, to collaborate with the Irishman for joint victory or to break away and win the stage alone. It was ambiguous counsel from a coach trapped between competing priorities. His job – indeed his governing philosophy – was to seek victory for the team, not for any one cyclist. Yet this was a French team, and the French public demanded a fifth Tour victory for Hinault. Allowing LeMond to seize the race lead would serve the first agenda but not the second. The element of surprise is key to any attack in a bicycle race. Alas, the man LeMond had been instructed to attack had heard the instruction, broadcast over a loudspeaker mounted inside the team car. Finally LeMond gave up, fell back, and let Roche set the pace. Roche limited his own efforts, still fearing LeMond might sprint away from him. Pedaling side by side, the two looked as if they were out on a recreational club ride. Before long, a swifter group containing several race favorites came up to join them. To LeMond’s surprise, Hinault was not among them. Clearly the gap that had separated the two Vie Claire stars was greater than forty-five seconds. As LeMond and Roche bided their time, a Spaniard and two Colombians sprinted off up the slope. LeMond was not allowed to bridge the gap and join them, because it was Roche, not they, who posed a threat to Hinault. LeMond finally rolled across the line with Roche and most of the other contenders, nearly three minutes behind the eventual stage winner, Pedro Delgado, an ascendant Spaniard. A minute or so after that, Hinault rolled in, a wounded hero, breathing through clenched teeth. An indulgent Bernard Tapie, the flamboyant team owner, draped a jacket over the Badger’s shoulders. LeMond’s slowed pace had allowed Hinault to regain much of the lost time. LeMond now stood two minutes and twenty-five seconds behind in the standings. Hinault had lost time, but LeMond had lost so much more. Had he been permitted to ride his own race that day, “Greg would have won the Tour, easily,” Le Guilloux conceded. Later, a camera caught an anguished LeMond bickering with Köchli, his coach. Recalling that fateful day in the Pyrenees three decades later, Roche remained convinced he and LeMond could easily have changed the outcome of the 1985 Tour on the slopes of the Tourmalet. With LeMond neutralized, Hinault would pedal to a relatively carefree victory at the 1985 Tour, despite a comparatively narrow margin of 102 seconds over the American. Roche would finish in third place, four and a half minutes back. Kelly would finish in fourth, more than six minutes behind Hinault. Anderson, the Australian, would claim fifth place. The Badger had seized his historic fifth Tour victory. Yet, as Hinault stood on the podium in Paris, the future of professional cycling stood at his flanks. LeMond would win the Tour in 1986, Roche in 1987, fulfilling the promise of cycling’s Anglo-Saxon invasion.